Edison Pen Co – Current Inventory Updated! After the Michigan Pen Show, we had a chance to get everything photographed and uploaded to the Current Inventory Gallery! If you can’t see the slideshow below, click here. Any pens in the gallery above are in stock and ready to ship, no waiting. You can email me if you are interested in one of these pens. In particular, I wanted to highlight a couple of Menlo Pump Fillers that I thought turned out really nice! These pens came to be as I had a couple pieces of pretty rare stock, but didn’t have enough length to make a whole pen. We thought that making a few Menlos with a black cap, section, and blind cap would be nice, and I pretty sure you’ll see more like these! I love how these turned out! If you like either of these pens, they are the absolute last of each material. I can’t make more like them. See below…. Menlo Pump Filler in Black Speck Acrylic…. 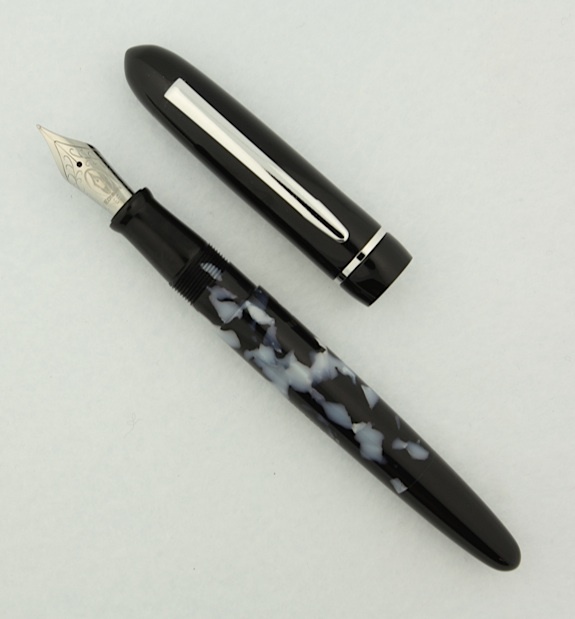 …and a Menlo in Black/White Cellulose Acetate….